Welcome to the first installment of Fork-bites. We decided to start giving you the bits and pieces before the whole cow. It seemed unfair to keep our followers from knowing where they need to spend their precious dollars. So we’re bringing you mini reviews so you know who we reccommend for great dining experiences. And then we will return to give you the Who? What? Whens? and Wheres? of our Culinary Adventures. 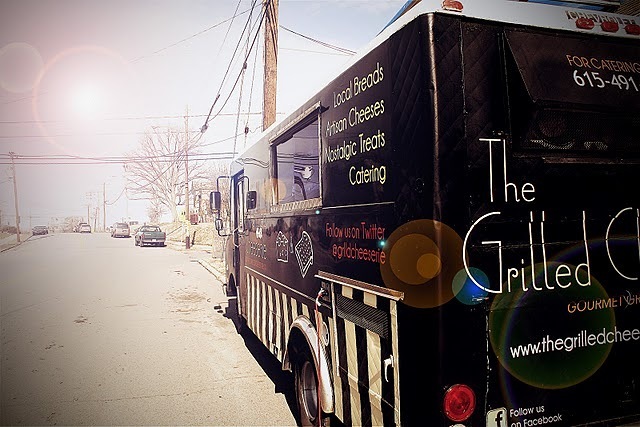 We dined @ the delicious Grilled Cheeserie Food Truck parked in the Centennial Park. This was not our first homage to find the nostalgic wagon that delivers those ooey-gooey perfections. Crystal and Joseph definitely have these delectable sammiches down to a science. I had the ‘The Caliente’, which has chorizo, pepper-jack, and avocado aioli layered between two grilled to perfection slices of sourdough bread.I salivate thinking of it. I hope you like it spicy because this sandwich has a kick that’s not intended for those without Pepcid AC in their pocket. (But it’s worth the pain) My wife had the Gruyere/Swiss blend which she says you can’t eat without asking for a side of pickles. She’s right, there’s something about the sweet, nutty, buttery, tangy and creamy that just works! If this wasn’t enough, we put the cherry on top with The Grilled Cheeserie’s old fashioned Tomato Soup. My grandma never made this unless it was accompanied with rice, but in this version, no rice necessary. It was delicious all on it’s own. Please, if you visit this little piece of Nashville Food Truck heaven, don’t adorn your cheese sandwich with any extra condiments, you can’t upgrade ‘Cheesy Perfection’. We definitely will become ‘serial Grilled Cheeser’s’ and we recommend you jump on the wagon. You won’t be sorry! Previous PostIron Fork 2012…Edible Deliciousness! Next PostFox’s Donut Den…Iconic Deliciousness!